How Shifting Your Perspective is the Key to Achieving Health and Wellness (Part 1 of 6). 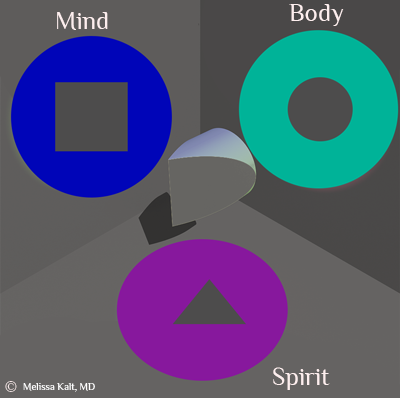 Melissa Kalt, MD, Melissa facilitates transformation through writing, workshops, and one-on-one work, drawing on her experience as a woman, physician, and mother of five. I’m going to tell you a secret, one you are welcome to share. It IS possible to achieve true health and wellness. The concept of polarity is your map. Drop your awareness into your body. Notice any symptoms…perhaps you have fatigue, indigestion, a headache, knee pain, anxiety, or something else. Maybe you have several. Consider how these symptoms impact your day. Do you miss out on work, activities or events? Are you unable to enjoy life fully due to pain? Are you unable to go for long walks with friends because you need to be close to the bathroom? Does your decreased productivity contribute to feeling overwhelmed? Do you avoid opportunities for leadership due to fear? Are you afraid things will never change? Ok. Shake that off. Now imagine what life would be like without those symptoms. What would you do? Would you travel, start a new business, start a blog, or seek a promotion? Would you take up dancing, running, or martial arts? What quality moments would you create with your family and friends? Where would you find joy? Now suppose that it is entirely possible to create that future. “I know, I know,” you’re saying. “I’ve been down that road before. Nothing has changed.” What if I told you it IS possible? What if I told you it is as simple as looking at things in a new way, changing your orientation? I love the concept of polarity. It so clearly demonstrates how brilliant, educated, responsible, compassionate people can have seemingly opposite viewpoints on a given topic, be it politics, religion, social justice, or healthcare. Each position very clearly sees its side, which is just one aspect or facet of the whole. An alternative position is simply seeing another facet equally clearly. Let’s apply this concept of polarity to wellness. In this way, the mind, body, and spirit are each one facet of the whole. Most people have done extensive exploration of the body in the search for answers. Modern life gives us abundant resources. We have access to outstanding healthcare. We have internet searching capability at our fingertips, even while in the car or in line at a store. We can download e-books and e-courses in a flash. Most likely you’ve had a thorough medical evaluation, taken medications, changed your diet, increased your exercise, tried complementary modalities, and more. If you’re still with me (and your symptoms are still with you), it does not mean that things will never change. It means that your answer wasn’t found on the circle, or in the body. Could it be that the answer is in the square or the triangle? Could it be that examining those facets will bring you some insight and awareness, and ultimately freedom from your symptoms? I love mind, body, spirit integration because it uses the concept of polarity to include multiple facets. Expand your view and transform your life. To take this deeper and access my free 6-part video series, Free Yourself, click here. What symptom would you most like to release? How would your life be different if you did? Originally published at melissakaltmd.com on April 18, 2017.